Guided tour or just explore? How do I get to the Tropenmuseum? Between the Oosterpark and the Mauritskade you will find the stunning, stately and monumental building in which the Tropenmuseum, or the museum of the Royal Tropical Institute, is housed. For families and student populations living in Amsterdam, this museum has been a top attraction for generations. Since the museum is located just outside the busy city centre, you will not find the same long lines of tourists here as you might encounter outside the Rijksmuseum or Anne Frank House entrances. 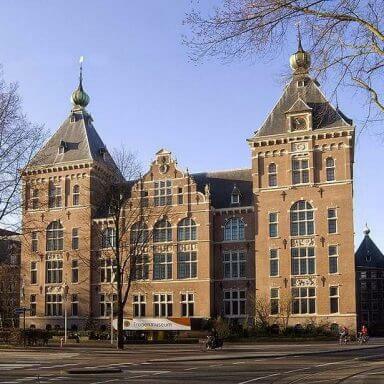 The Tropenmuseum is located in a beautiful, historic building. This is no run-on-the-mill museum. You actually feel like you are in the tropics! The Museum is located in one of the most beautiful and unusual museum buildings in the Netherlands. This incredible experience will take you on an impressive journey all around the world! You will become acquainted with the daily lives of distant communities as you are introduced to their art, utensils, film and music, and look at the stunning photographic collection. I always find it fascinating to observe and learn about different cultures, and a journey together with them through time or distance makes this possible. 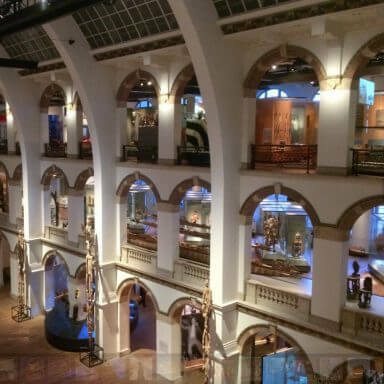 The Tropenmuseum began as the Colonial Museum in 1864, founded by Frederik Willem van Eeden. He was then director of the Arts and Crafts Museum in Haarlem, which led to the decision to establish the Tropenmuseum in Haarlem in 1871. This was done in the famous Welgelegen pavilion on the Haarlemmerhout. It was the first ever colonial museum in the world. However, by1923 Welgelegen pavilion had become too small for the collection and it was agreed that a new building would have to be built in Amsterdam. The chosen plot was the old Ooster cemetery on Linnaeusstraat, next to the Oosterpark. Construction was completed in 1926 and since then the Tropenmuseum has remained at this stunning address. The Tropenmuseum is a lovely museum, which has kept up with the times. The permanent collection is really worth seeing and includes exhibitions about the Dutch colonies and the history of slavery. You can get some great souvenirs in the museum shop. Unfortunately, the restaurant is only open until 6 p.m., but it has a very cosy atmosphere. The Tropenmuseum’s enormous collection of exotic objects is exhibited in an extremely original way. I was really taken aback when I visited this museum for the first time. Everything has been created so that the different environments of the Tropics are tangible; you feel like you are in another world. There are no long showcases or stately rooms. 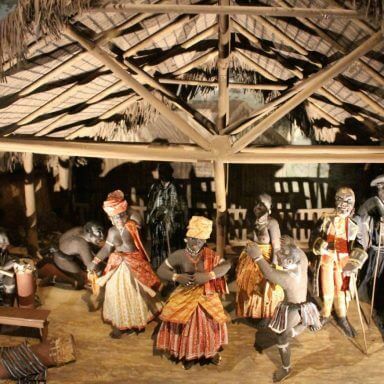 Instead, you will find village reconstructions, music and performances, and stories told using the latest media. The museum shows you its treasures in their proper context. You get the full picture where traditions and histories of different world cultures is concerned. An enormous collection of 175,000 objects and 80,000 historical photographs which I highly recommend for both young and old. The building is huge and it needs to be, as it houses entire village reconstructions from Africa, Asia and South America. When you first step through the Tropenmuseum main doors you might mistake it for a palace; the entrance is impressive. From the marble entrance hall you walk up the wide staircase and along pillared galleries into various, completely different environments. You might be taken on a journey through fragrant Indian kampongs or North African villages. You can feel the tropical vibes of the Caribbean and South America. In fact, you will probably forget that you are in Amsterdam! The characteristic smells and sounds make the experience very real. With the museum’s permanent and temporary exhibitions you will be able to connect with distant cultures and listen to beautiful stories from all over the globe, and all under one roof. Immerse yourself into the daily life and traditions of people from far away in time or distance. From contemporary art to historical photographs, from religion to unique utensils, a visit to the Tropenmuseum feels like a journey far beyond any physical borders! Many people (including myself) prefer to walk through a museum at their own pace. In this case you can opt for a free audio tour and seek out what you want to see without having to rush, with the added help of a ‘guide’ to tell you more about the objects, sights and showcase exhibitions. Group tours are provided by museum guides. 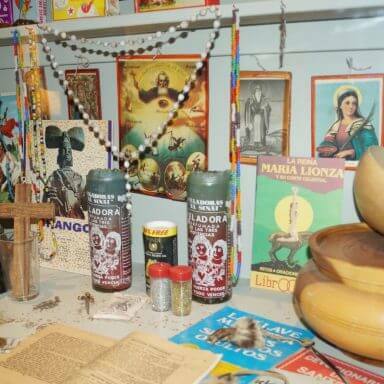 You can choose your tour by region (Africa, the Caribbean, the Dutch East Indies or India) or by theme, including ‘Highlights’, ‘Evil’, ‘Hidden stories of the Royal Tropical Institute’ and ‘People & the environment’. The Tropenmuseum is located at Linnaeusstraat 2 in Amsterdam Oost. You will be better off visiting the museum by public transport. There are very few parking spaces close by and the available ones are pricey. Trams 9 and 14 will take you there. What many people like to do, and what ends up being a great day out, is buy a Hop On Hop Off Bus ticket. Get off at the Artis Zoo stop and combine a zoo trip with the Tropenmuseum. Two major Amsterdam attractions on the same day! The museum is open from Tuesday to Sunday from 10 a.m. to 5 p.m. You can order your tickets for the museum here. For children ages six to thirteen and their families, Tropenmuseum Junior is really worth a visit. This is the children’s section of the Tropenmuseum. Tropenmuseum Junior was founded in 1975 and is the longest-running children’s museum in the Netherlands, and one of the oldest in Europe. In their own area, kids can make personal voyages of discovery, play exotic instruments, act the parts of various characters and learn about different cultures during play. The dynamic design makes this exhibition space a totally different world in which children can’t help but be completely immersed. Objects come to life and kids take an active part in the exhibition itself. This will be a part of your Amsterdam visit that the children will never forget, and which will also introduce them to cultural differences in a positive and attention-grabbing way. This article has me looking forward to my next Amsterdam trip! 660 visitors rated The Tropenmuseum average 4.55 stars out of 5.